The National Institute for R&D in Microtechnologies - IMT Bucharest is an autonomous organization of public interest, currently coordinated by the Romanian Ministry of National Education, acting as a non-profit research company. Dr. Adrian Dinescu obtained the M.Sc. degree (1993) in Solid State Physics and the PhD degree (2010) in physics, both from University of Bucharest. Between 1993 and 1997, Adrian Dinescu was with the National Institute for Research in Electronic Components, working in the field of optoelectronic devices fabrication. Since 1997 he is with IMT-Bucharest where he is currently involved in micro and nanoscale characterization using FE-SEM and in structuring at the nanoscale using Electron Beam Lithography. His expertise also includes materials processing and device fabrication. Dr. Adrian Dinescu coordinated 10 national research projects and was the coordinator from the Romanian part of the FP-7 STREP project - CATHERINE. He co-authored about 25 papers in refereed international journals. Raluca Müller, received the M.Sc (1978) in Electronics and Telecommunications from “Polytehnica” University of Bucharest, Romania and PhD in Electronics and Telecommunications, from the same university. 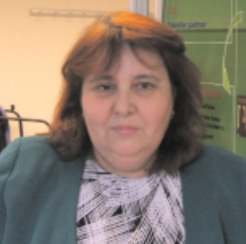 From 1978-1994 she was research scientist with ICCE-Research Institute for Electronic Components, Romania; since 1994 she is with National Institute for Research and Development in Microtechnologies- IMT Bucharest. She was Head of Development in Information Technology Department (2003- 2007), respectively Center of Scientific Services (2007-2009) and Scientific Director starting with 2009. Raluca Muller has experience in microtechnology and MEMS/MOEMS microsystem area as well as in micro -nanofabrication including microsensor design and manufacturing. She was leader of an important number of national projects and networks and was partner and scientist in charge from IMT for several FP6 projects (Marie Curie Training Network ASSEMIC, CA -IPMMAN, Leonardo da Vinci- Microteaching) and part of the team of other 2 FP6 (PATENT, WAPITI) and 1 FP7 (CATHERINE) projects. Raluca Muller was the Coordinator of “Basic Funding ” Programme of IMT-Bucharest (starting 2003). She was involved in teaching activities as associated professor at Univesity “Valahia” of Targoviste” (1997-2003) and for master courses (2009-2012) related to smart sensors at “Politechnica” University of Bucharest. R. Muller is author and co-author of 20 ISI ranked papers (Sensor&Actuators, J. of Micromechanics and Microeng, Optical Materials, J. of Luminescence, Thin Solid Films, etc)., more then 80 conference papers. Other professional activities: Coordinator of software, characterization, nano-engineering equipments’ investment; Member of the National Commission for “New materials, Micro and Nanotechnologies “ ( 2007-2011), Member of the Organizing Committee for the IEEE International Conference CAS (2002-present) and Micromechanics Europe 2002, Member in the Scientific Committee EMRS 2009 – Symposium L: Bio & Chem Sensors and Transducers: from Materials to Systems; IEEE and MINAM Platform member; Referent for national projects, conferences: CAS, 4M, and journals: ETRI Journal, Electronics Letters, Materials Science and Engineering B, Applied Optics. Dr. Dan Vasilache obtained the Licence degree (1995) in Atomic Physics from University of Bucharest and the PhD degree (2011) in electronics from Politehnica Univ., Bucharest. He was with the National Institute for Research in Electronic Components starting from 1995, working in the field of RF MEMS. Since 1997 he is with IMT-Bucharest where he is currently involved in MEMS and NEMS design and manufacturing, and between 2010 and 2012 he was with FBK-irst Trento, Italy. Dr. Dan Vasilache coordinated 5 research projects and he was part of the team in more than 40 national research projects and more than 10 international projects. He co-authored more the 150 papers, about 25 in refereed international journals. Constantina SIMON graduated the Bucharest Academy of Economic Study. range. He has published 159 scientific papers: 86 in journals (76 ISI papers) si 73 communications at various national and international conferences. The papers are dedicated to the following areas: nanoelectronics, microwaves, MEMS, optoelectronics. He is co-author of several books.